I know many European people love skiing! in Austria, Switzerland, Netherlands, Germany, Sweden etc Ski is the main hobby in winter time. with having this in mind, Northern Iran's climate would be a huge attraction for European Tourists in winters. (Just look what Tom has said in his post about Skiing in Iran). we have 4 main ski resorts in Iran, near Tehran: Dizin, Tochal, Shemshak and Ab'ali. I know there much more fields around the country, but regretfully I don't have enough information. 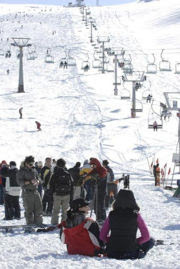 Dizin is the longest ski resort in Iran and among the 30 highest ski resorts worldwide. because of the altitude, which is 11,800 ft, the ski season in Dizin lasts longer than European ski resorts. Regarding the accommodation facilities, Dizin has got two hotels, 19 cottages and 5 restaurants. These nice hotels, cheap and beautiful villas and private apartments around the Dizin ski resort accommodate thousands of people every year. Tochal ski resort is another good sample, which you are able to ski for more than 7 months a year. Tochal has the longest cable grip (Gondola lift also called Tele-Cabin). Tochal tele cabin has 7 stations and is one of the longest and most scenic in the world regarding wikipedia's list. A modern 5 star ski hotel hosts the skiers at the end of the lift.